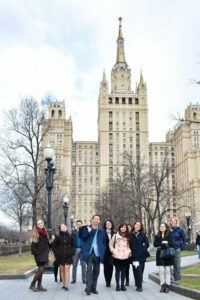 The tuition costs of studying at Lomonosov MSU is 350, 000 rubles, which is approximately equal to 4800 euro or 5390$ per year. Each year a limited number of scholarships is available for exceptional applicants. The amount of scholarship: tuition fee for two years of studies. Availability: All the applicants for the program will be considered for a scholarship. You do not need to send any additional documents, stating your wish to apply for a scholarship. Please note, that the admission and scholarship decisions are made on a rolling basis. If you have any further questions, please do not hesitate to contact us via admissions@politiq.ru . The web is the most comprehensive and authoritative source of information for travelers to Moscow, Russia. hotels and airport transfers to detailed descriptions of the city’s sights and cultural attractions. sites, our special focus will be on Russian society, culture and religion. maintains probably the largest sales catalogue of Russian sheet music titles in the World. Learn a language right here with hundreds of free language-learning lessons, games, and activities. the Russian language, and hand-picked links to the best Web sites about the Russian language.